Good news to Korea-crazed travelers to scenic Gyeonggi-Do, the most charming region in Korea. In conjunction with its recent strategic Memorandum of Understanding (MoU) signing with Gyeonggi Tourism, AirAsiaGo.com is rewarding its customers with free passes and discounts to explore one of UNESCO’s World Cultural Heritages which is currently attracting worldwide attention. Please take note, all AirAsiaGo.com travellers who have booked their Korean holiday for travel between now and 31 December 2014 will stand a chance to win FREE passes to unforgettable Gyeonggi-do tourist attractions such as Trick Eye Museum, Petite France, Everland, Onemount and Hanwha Aqua Planet. 20 lucky winners will be chosen randomly by AirAsiaGo.com and announced via email. For those who did not win, you are entitled to receive discounted entrance fees at all of the attractions listed above by booking Flight + Hotel/Hotel-only packages on the AirAsiaGo.com website. 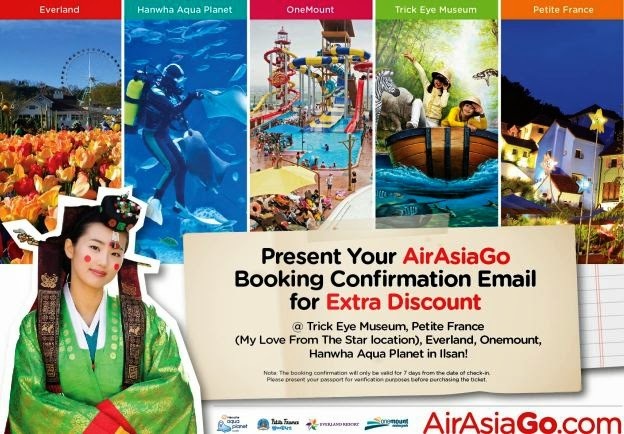 All you need is to present your AirAsiaGo.com Booking Confirmation email to access the following discounts; Trick Eye Museum (25% off), Petite France (25% off), Everland Resort (20% off), Onemount (50% off) and Hanwha Aqua Planet (50% off). Trick Eye Museum is an interactive museum with eight thematic exhibitions, with another museum located within for visitors to experience and enjoy ice sculptures, igloos, and slides. As for Petite France, it is a small French Village in Korea which consists of 16 French-styled buildings. Well-known Korean dramas such as ‘Secret Garden’, ‘Beethoven Virus’, ‘My Love from The Star’ and an episode of the hit TV series ‘Running Man’ were filmed here. 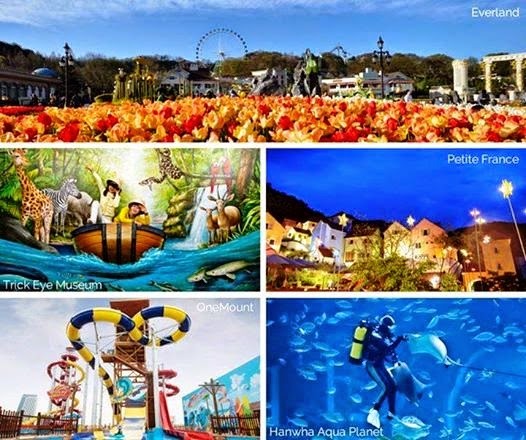 Everland is listed as one of the four major theme parks in the world, and Onemount is the world’s first sports theme park where summer and winter coexist all year round. Lastly, Hanwha Aqua Planet is the only zoo adventure located inside an aquarium where visitors can marvel at marine life, land creatures and birds all in one location.